WASHINGTON -- At least seven people are dead after one commuter train plowed into the back of another yesterday afternoon in the deadliest accident in the 33-year history of D.C.'s Metro system -- an "unbelievable nightmare" for the people on board according to D.C.'s mayor. Seven fatalities have been confirmed as a result of an above-ground collision of two Metro trains between the Takoma Park and Fort Totten stations on the Red Line in northeast Washington. While there have been reports of up to nine deaths, Mayor Adrian Fenty said at a Tuesday morning news conference that seven have been confirmed dead. "With the ... confirmed fatalities, it is my preliminary understanding that this would be the deadliest accident in the history of our Metro train transit system," Fenty said. One of the fatalities was the operator of the second train -- Jeanice McMillan of Springfield, Va. Metro spokesman Steve Taubenkibel said McMillan had been a Metro employee since January 2007. A six-car train headed toward downtown and destined for Shady Grove collided with another train heading the same direction on the same track at about 5 p.m. -- the height of rush hour. The first train was stopped, waiting for another train to clear Fort Totten Station ahead, Metro General Manager John Catoe said. The second train, one of the oldest in the Metro fleet, crashed into the first and jackknifed on top of the first train. It is unknown how fast the trailing train was traveling, authorities said. Investigators will try to determine if there was a recorder on board and if it survived the crash. It would be simpler than a black box recorder. Investigators also will try to determine if the train was in automatic mode, as it should have been during rush hour. D.C. fire spokesman Alan Etter called it a "mass casualty event." One of the trains was compressed about 75 or 80 percent, according to D.C. Fire Chief Dennis Rubin. "Firefighters now have the task of cutting open and finding out if there are any more of our neighbors in there," Fenty said. He called it a dark day for the District. "Our hearts go out to all the families involved," Fenty said. Sabrina Webber, a 45-year-old real estate agent who lives in the neighborhood, said the first rescuers to arrive had to use the "jaws of life" to pry open a wire fence along rail line to get to the train. Webber raced to the scene after hearing a loud boom like a "thunder crash" and then sirens. She said there was no panic among the survivors. Passenger Jodie Wickett told CNN that she was sending text messages when she felt the train hit a bump. She was able to send that observation to her friend. "From that point on, it happened so fast, I flew out of the seat and hit my head," she said. "The people that were hurt, the ones that could speak, were calling back as we called out to them. Lots of people were upset and crying, but there were no screams." One man said he was riding a bicycle across a bridge over the Metro tracks when the sound of the crash got his attention. "I didn't see any panic," Barry Student said. "The whole situation was so surreal." Rubin said 76 patients were taken to area hospitals. Fifty were described as "walking wounded." Fourteen suffered moderate, non-life-threatening injuries. Six suffered critical life-threatening injuries. Two D.C. firefighters were injured. Two people were transported by air to local hospitals. At Howard University Hospital, Dr. Johnnie Ford, an emergency room doctor, said a 14-year-old girl suffered two broken legs in the accident. A 20-year-old male patient "looked like he had been tumbled around quite a bit, bumps and bruises from head to toe," Ford said. 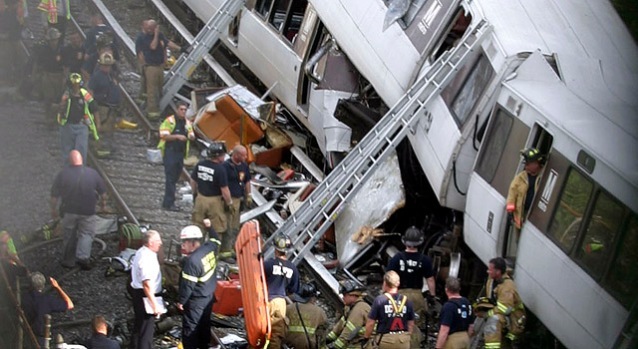 Numerous passengers were trapped in the trains and emergency workers used rescue tools to cut them from the wreckage and transport them to hospitals or treat them at the scene. Rescue workers propped steel ladders up to the upper train cars to help survivors scramble to safety. Seats from the smashed cars spilled out onto the track. No survivors are left on the trains, but due to the severity of the damage, it is unknown if other fatalities remain. Though the collision took place during rush hour, Metro's John Catoe said the trains were not full. Each train had six cars and was capable of holding as many as 1,200 people. Safety Board member Debbie Hersman said the trains were bound for downtown. That would mean they were less likely to be filled during the afternoon rush hour. Police and fire officials asked people concerned about loved ones to stay away from the scene and call 311 for information. The D.C. Health Department set up a toll-free patient information and tracking number (866) 797-4930. The city has set up a family reunion center with the Red Cross' help at the recreation center at 501 Riggs Road NE. Counselors are on hand to help family members coping with mental stress and seeking information. At least 200 members of D.C. Fire and EMS responded. Firefighters from Fairfax and Arlington counties in Virginia and Prince George's and Montgomery counties in Maryland were called to D.C. to assist with other calls to the D.C. fire department. Two FBI agents are at the scene, News4's Jackie Bensen reported. The FBI agents are at the scene to provide mutual aid and support, like evidence recovery or technical equipment, according to a spokesperson from the Washington field office. Nothing indicates criminal activity. Federal authorities had no indication of any terrorism connection, Homeland Security Department spokeswoman Amy Kudwa said less than two hours after the crash. "I don't know the reason for this accident," Catoe said. "I would still say the system is safe, but we've had an incident." The National Transportation Safety Board took charge of the investigation and sent a team to the site of the accident. D.C. police and the FBI also had investigators at the scene to help search the wreckage for any overlooked injured or dead passengers and evidence. Trains did not travel between the Brookland and Fort Totten stations. Shuttle service was established, but Metro spokeswoman Cathy Asato advised riders to completely avoid the Red Line Monday evening. More restrictions were put in place for Tuesday's commute. Click here for the details. "Michelle and I were saddened by the terrible accident in northeast Washington, D.C., today," said President Barack Obama. "Our thoughts and prayers go out to the families and friends affected by this tragedy. I want to thank the brave first responders who arrived immediately to save lives. My staff has been in touch with Mayor Fenty's office and will continue to monitor the situation." The last time two Metro trains collided, about 20 people were injured when an empty train backed into a train carrying passengers on Nov. 3, 2004. The only other time in Metrorail's 33-year history that there were passenger fatalities was on Jan. 13, 1982, when three people died and 25 people were injured as a result of a derailment underneath downtown. One car of a train derailed while the train was backing up through a crossover switch south of the Federal Triangle Station. The car was pulled sideways and crashed into the concrete pillar separating inbound and outbound tracks. That was a day of disaster in the capital -- shortly before the subway crash, an Air Florida plane slammed into the 14th Street Bridge immediately after takeoff in a severe snowstorm from Washington National Airport across the Potomac River. The plane crash killed 78 people. For more on previous crashes, click here. For Metro's latest status updates, visit their Web site.